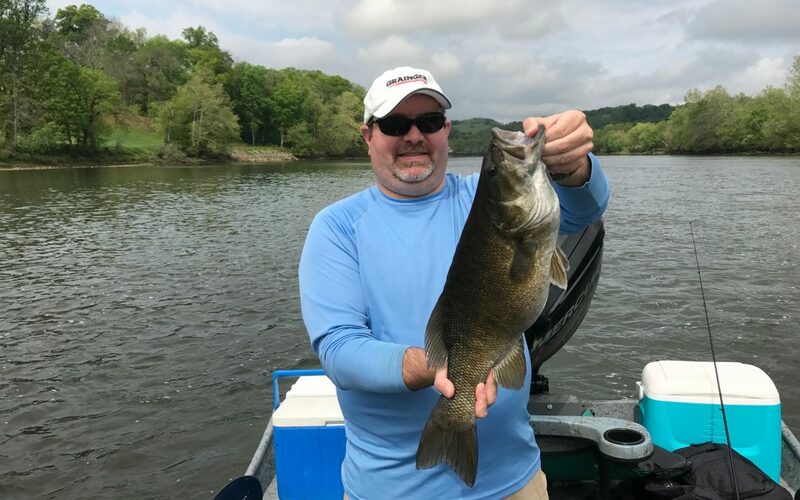 I had the pleasure of taking Greg on another guided trip this Spring on the French Broad River to fish for some of those big pre-spawn female smallies. The day before I was fishing and found a area where there were a lot of smallies chasing threadfin shad. It was overcast and it rained on and off throughout the day. Perfect fishing weather. Periodically during the the day the smallies would explode into a feeding frenzy as schools of threadfins moved through. They were blowing them out of the water and a couple of times I saw smallmouths completely clear the water as they jumped on the fleeing schools of shad. I told Greg that the day before I had seen at least two big fish that appeared to be around five pounds that hit threadfins right next to the boat, but for some reason I was not able to get them to hit. I did manage to catch 54 smallies in five hours of fishing with two over twenty inches, but the truly big fish had eluded me. The next day I took Greg back to that same spot and the big fish did not elude him. He managed to catch 32 smallies on the trip. The two biggest fish were both 21 1/2 in. long and weighed 5 lb. 3 oz. and 4 lb. 15 oz. He also had another fish on that was just as big as the other two, but during the fight the fish made a spectacular leap and threw the hook. It was a great day of fishing and I look forward to the next trip with Greg.